School is starting in a next week. As much as I love summer, and I love having my kids home doing fun things (or nothing at all), there is something about the rituals of a school year. Rituals like bedtimes, homework, dinner planning, going to the gym, and most important…. I realized several years ago (okay, 15 years ago), how important it is to be awake during the day. I mean, with 4 kids I can’t certainly close my eyes anytime I want for a catnap. Not that I’m much of a napper anyways. But coffee? Keeps me going. And I love it. With a splash of cream, thank you. Which is probably why I like these cupcakes. 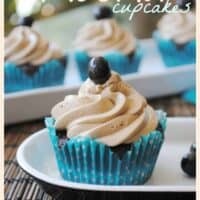 They are a dark chocolate cupcake (with a hint of espresso), but the frosting? Oh my. Full fledged mocha. Chocolate and coffee buttercream. It’s like cream in my coffee. No really, same calories too. Right? Anyways, do you like coffee recipes? Check out these fun coffee inspired drinks and treats…. In a bowl, mix flour, cocoa, salt, baking soda, baking powder and espresso powder. Set aside. In a measuring cup, mix together cooled coffee and buttermilk. Set aside. In large mixing bowl, beat butter and sugar together until fluffy, about 5 minutes. Add eggs, beating in one at a time. Slowly add in dry ingredients, alternating with milk mixture (about 3 additions of each). 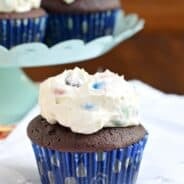 Pour batter into cupcake liners, no more than half full. Bake in a 350 degree oven for 15-20 minutes. Remove and cool completely. For the frosting, warm cream for about 30 seconds in microwave. Whisk in espresso powder and chocolate syrup. Set aside. Beat butter, cream cheese and powdered sugar together, until fluffy. About 3-5 minutes. Adding cream mixture slowly until desired consistency. 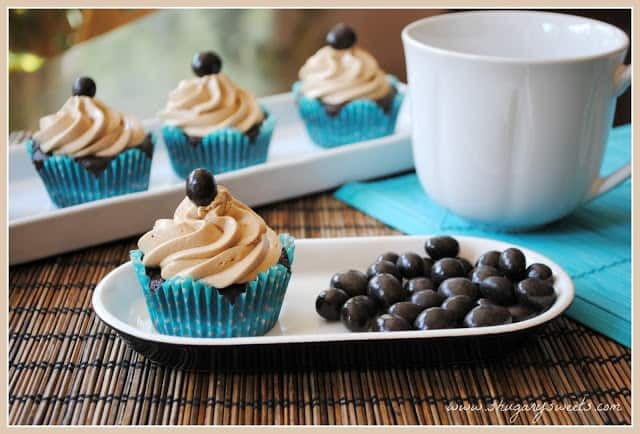 Pipe frosting onto cooled cupcakes and garnish with chocolate covered espresso bean (if desired). I would put the taste of coffee in everything, if I could. I love that these cupcakes have the coffee flavor going on in the cake and the frosting. It hardly seems possible that school starts next week! I heart coffee treats so very much!!! 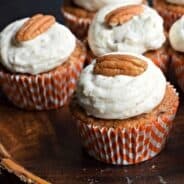 And coffee cupcakes to keep me awake during the day…yes, please:-) I am looking forward to school day rituals to get started too!!! One more week of fun and then let the routine begin!!! Hear Hear! Or is it…Here Here? I love and NEED coffee! But coffee flavored treats are one of my most favorite things. Yum! I am *just* starting out when it comes to coffee drinking, and I pretty much like mine more milk than actual coffee (haha) but I know I’d like these cupcakes. They’re the perfect coffee and chocolate bite that I love–and they look beautiful! Coffee flavored treats make me giddy. Yummy!!! is this your go-to choc cake recipe again? I need to make it! and coffee-anything is always a hit with me! Averie, why yes it is! Although this time I added some extra espresso powder for a coffee kick! Ohhhh Yeahhhhh! Those looks wonderful! Next step up is to replace some of that cream with Kahlua 🙂 Yummy! Beautiful. My favorite chocolate desserts are the ones that also include espresso or espresso powder. It adds such an amazing richness! Thanks for your sweet message on my blog (http://ephesianswife.blogspot.com/). I can’t wait to start following you…your food looks amazing!!!! These seriously are amazing! I think I would like one for breakfast! 🙂 Thanks for mentioning my bars! Ummm, thanks for making those yummy bars! 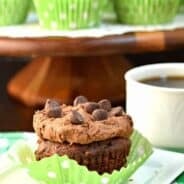 I’m looking for a perfect chocolate cake/cupcake recipe. I should’ve known to come here first, Aimee! and anything that involves coffee has my name written all over it. I honestly love mocha anything and wonder why I haven’t posted my mocha brownies on my blog yet! 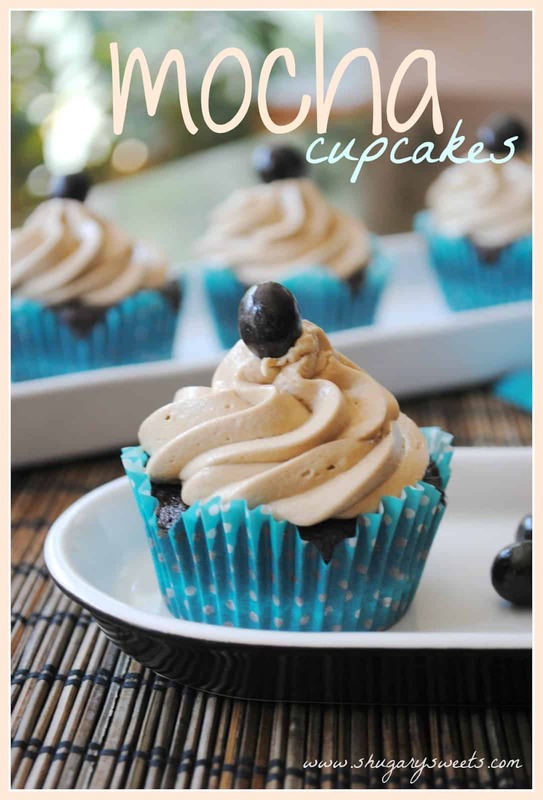 Sally, you must try this chocolate cake/cupcake recipe. It’s awesome!!! And I’m looking forward to some mocha brownies! I love anything with mocha! These look fabulous!! Looks yummy! I am also looking forward to the kids going back to school, but we have 2 weeks until then. Enjoy the last few summer days! I’ve been scouring the web like a madwoman with a scrub in a dirty house for a good coffee dessert recipe, and this one’s so going into my recipe box. Er, maybe with some Kahlua thrown in for good measure. Thanks for sharing! Thanks. I miss my kiddos while they are at school. Yummy! Mocha anything is always fabulous! oh yum!!! and the icing…..I would eat it all…so I cannot make this recipe. those are absolutely STUNNING. but knowing my sweet tooth, i’d eat one for breakfast with a cup of coffee and have the jitters all day. i’ll just have to have the cup of coffee in the afternoon, i suppose! Coffee. And chocolate. And cupcakes? Be still my heart!! Thanks for sharing these, girl!! Oh how yummy! These look divine! Would love for you to come visit my Get Social Sunday link party and show off your awesome blog! What an awesome roundup! I’m sure any kid would be thrilled to have a Shugary Sweets creation in their brown paper bag! Those look amazing! Really want to make some! Hi Aimee, I tried these cupcakes but they did not rise. Are they supposed to rise? I purchased all fresh ingredients so I don’t think that was the cause of them not rising.